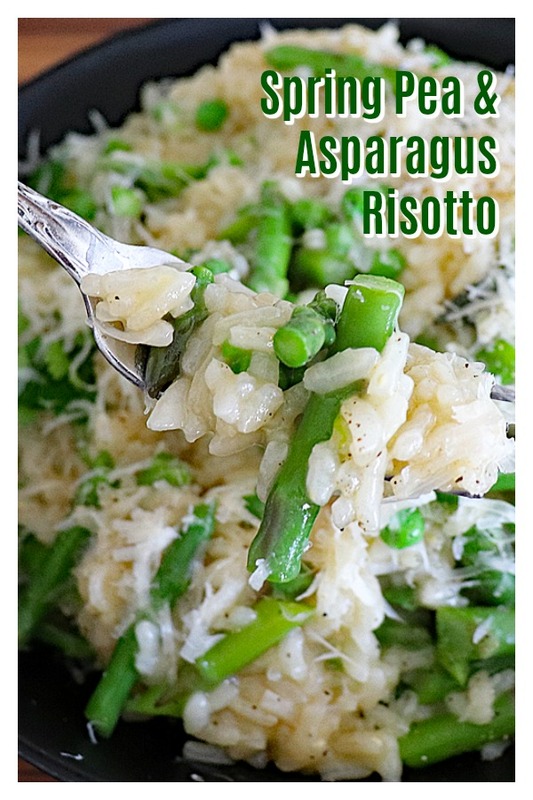 Spring is here and I thought I would bring you a really simple, yet flavorful dish that is perfect any time. It would also make a great main (or side) for Easter dinner. I’m offering both a vegan and vegetarian version and details for each will be in the recipe card below. 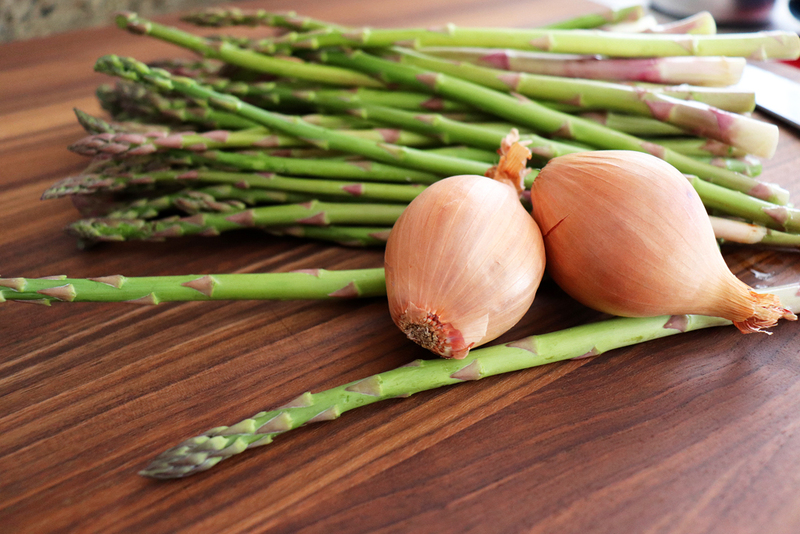 The first step is to prepare the asparagus by breaking the tough ends off and cutting into 1-1/2″ pieces. I like to cut on the diagonal for a bit of added interest. Finely dice the shallots. I am using shallots because they are milder than onions and really work well with this recipe. 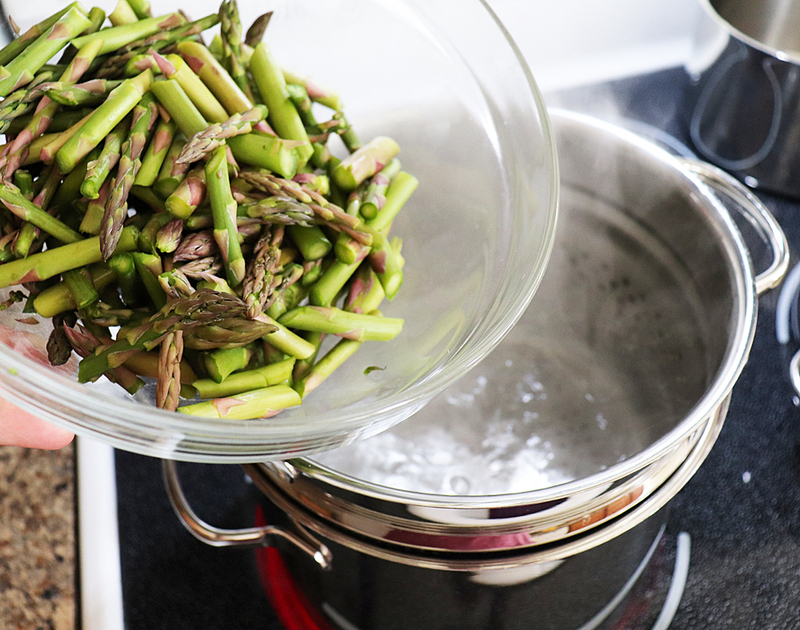 We’ll need to blanch the cut asparagus for about 2-3 minutes in boiling water. Drain and add to a bowl that you have prepared with an ice water bath. This both stops the cooking and gives them that bright green color. 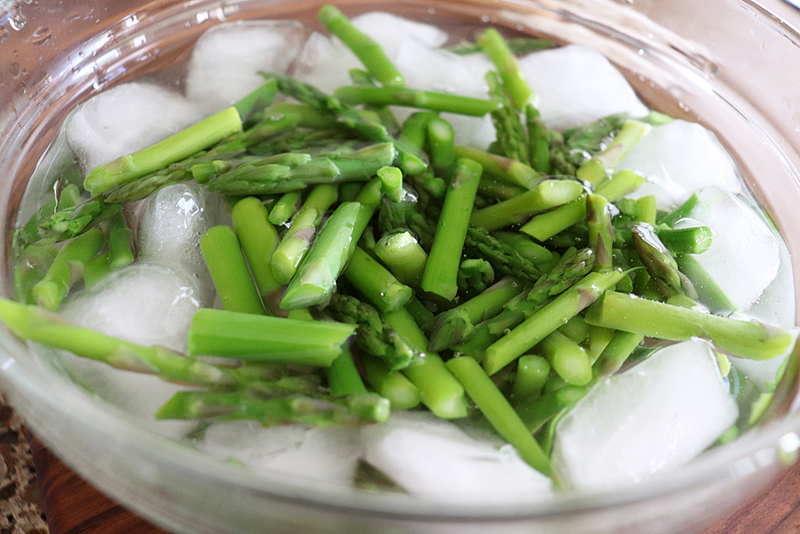 Drain the cooled asparagus to a bowl and add the Spring (or frozen peas). Set aside. Let’s make some Arborio Rice! To a large saute pan, add butter (or vegan margarine) and olive oil. 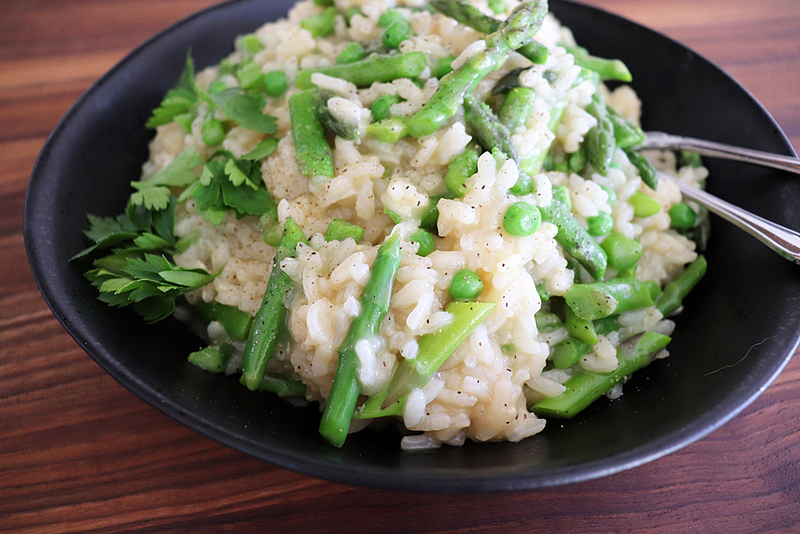 Saute the finely diced shallot for about 2 minutes or until tender and then add the dry, uncooked Arborio rice. Stir and cook until opaque in color. During this time, go ahead and add the broth and water to a pan. We’ll be slowly ladling it into the rice. One or two ladles at a time, add the broth and cook, stirring constantly until it is almost absorbed. Then add more broth. Continue until all of the broth is added and absorbed. PLEASE NOTE: Your rice may require more broth (or water) to complete the cooking process. The best way is to just taste it to see how tender it is becoming. 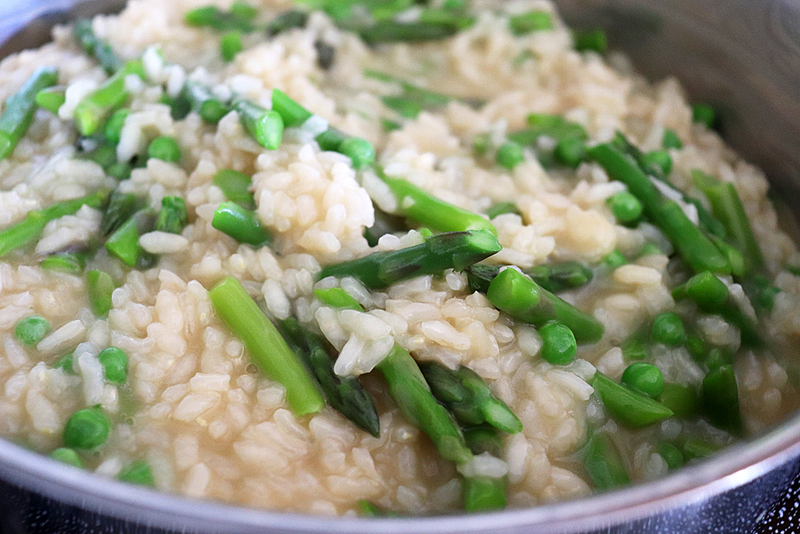 Add the blanched asparagus to the cooked rice with a punch of salt and pepper. 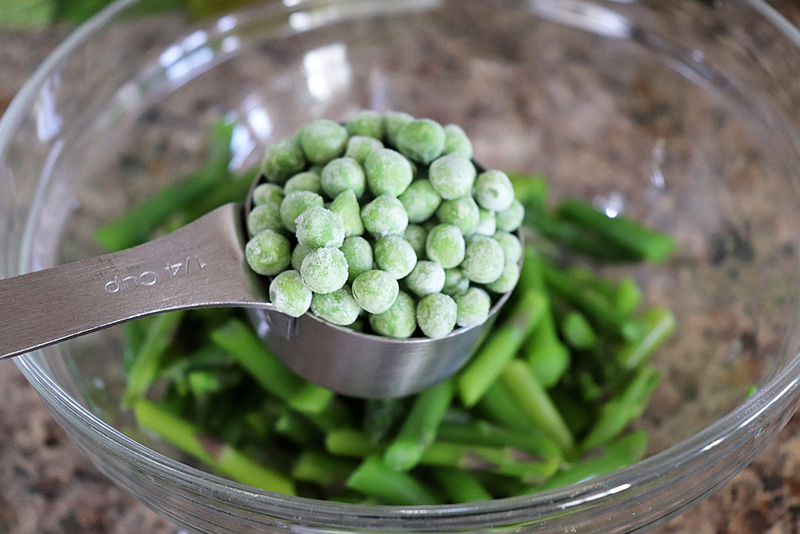 Give everything a good stir and allow the peas to heat through. At this point, it’s time for some cheese (or vegan alternative). 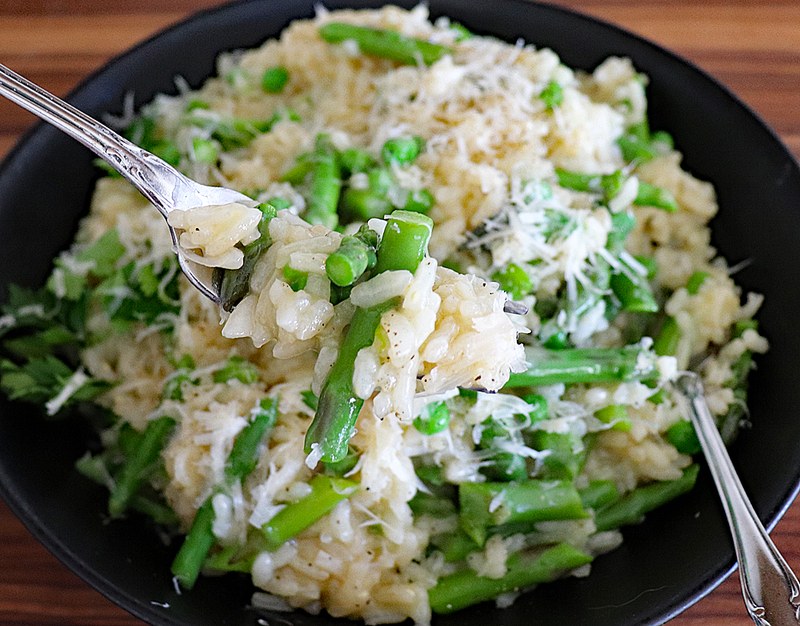 Traditionally this is parmesan. 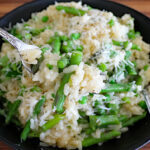 There are some great vegan parmesan products out there as they become more and more popular. Garnish with a bit of parsley and serve immediately. Trim tough ends from asparagus and cut into 1-1/2" pieces. I like to cut on the diagonal. Toss the cut pieces into boiling water for about 2-3 minutes. Remove and immediately submerse in ice cold water to stop the cooking. 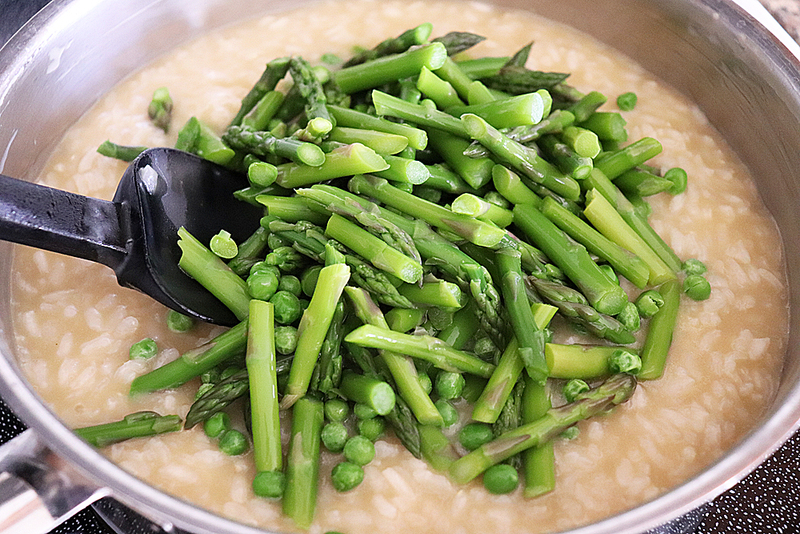 Drain the asparagus into a bowl and add the Spring (or frozen peas). Set aside. 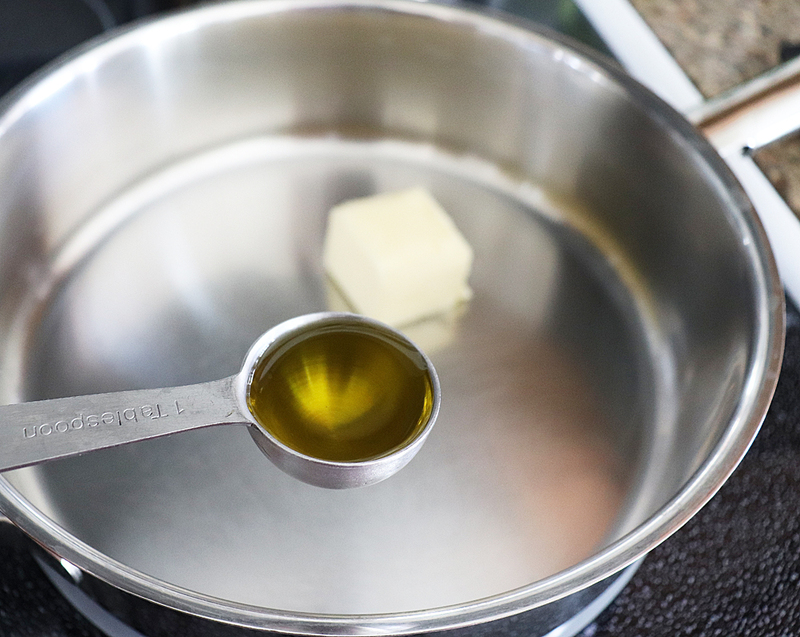 In a large saute pan, add the butter (or vegan margarine) and oil. Saute the finely diced shallots until tender. 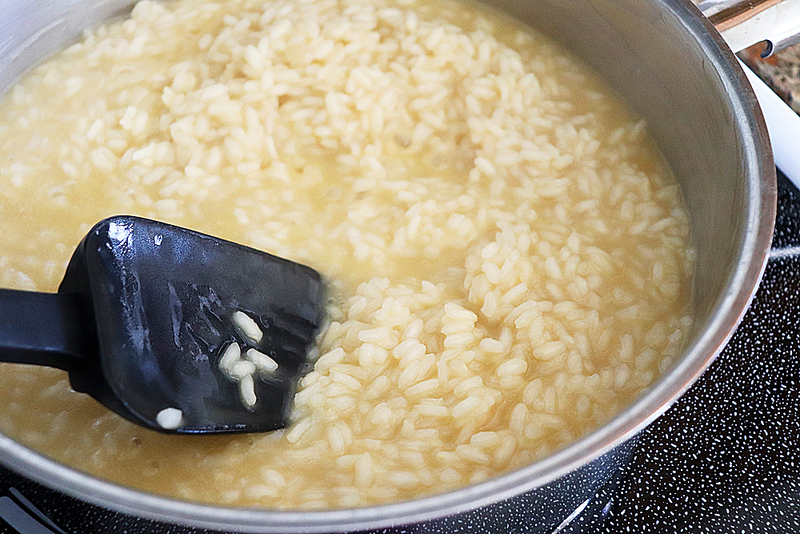 Add the uncooked Arborio rice and saute until opaque. While this is happening, place a pot over medium heat and add the broth and water. Ladle two scoops into the rice. 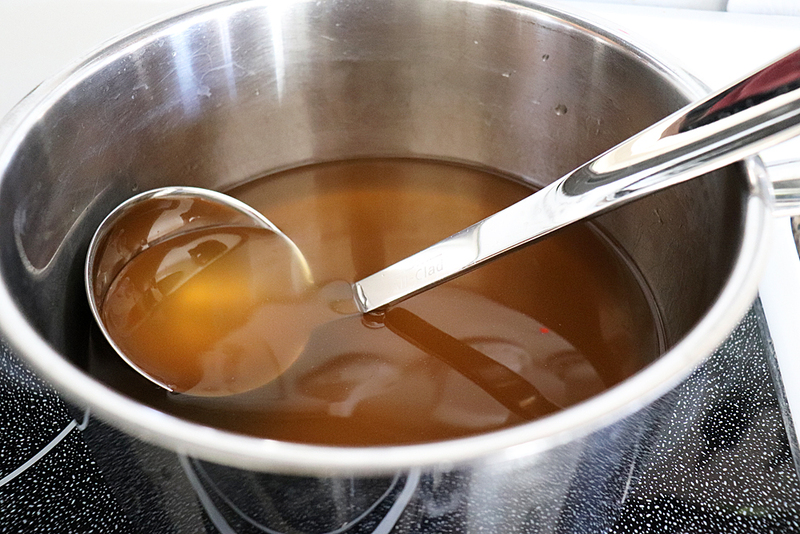 Stir until most of the liquid is absorbed and add more broth. 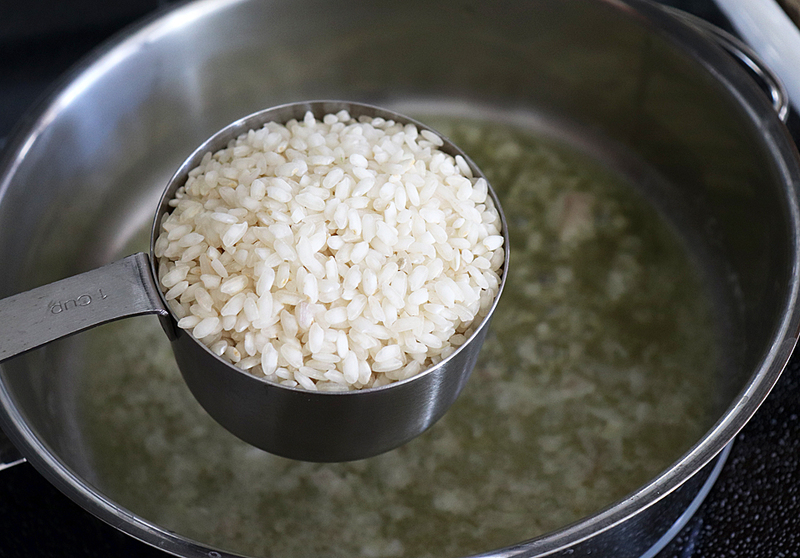 Continue this process until all of the broth has been used and the rice is tender. PLEASE NOTE: Your rice may require more broth (or water) to complete the cooking process. Stir in the veggies and parmesan (or vegan alternative), adding salt and pepper to taste.